Educational activities dedicated to children from 6 to 11 years old are held on Saturday afternoon. These workshops take place in the museum galleries in order to discover and learn about several issues around the field of natural sciences, starting with the paleontological collections. Children will be assisted by a museum educator while experiencing many activities related to the world of fossils. For a more complete description of the workshops go to Events. Meeting place: the Museum, 4:15 pm. This workshop takes children through the museum’s galleries to discover and learn about fossils. Students will be guided by a museum educator during the simulation of a paleontological excavation and, after the study of the finds, they will be involved in a mysterious “fossil hunt”. This workshop takes children through the museum’s galleries to discover and learn about minerals. Children will be assisted by a museum educator during digital microscopic observations; they will analize and study the classification of rocks and minerals and, after the laboratory, there will be a visit focusing on a specific topic at the museum. This workshop takes place at the Sandro Pertini park in Ovada in order to show young students the main characteristics of the natural world. They will become familiar with plants, animal footprints and other similar topics. Meeting place: the Museum, 3:30 pm. 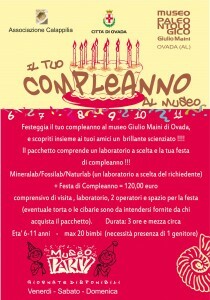 Celebrate your birthday at the museum and discover yourself and your friends as brilliant scientists! Children can celebrate their birthday at the museum with a program package which includes a workshop of your choice and the birthday party! Our young geologists will get to know rocks and crystals by studying minerals. It includes a playful workshop dealing with search and is followed by a “mineral hunt” through the museum’s galleries. A travel back in time will allow the next generation of paleontologists to discover the most ancient history of our territory. 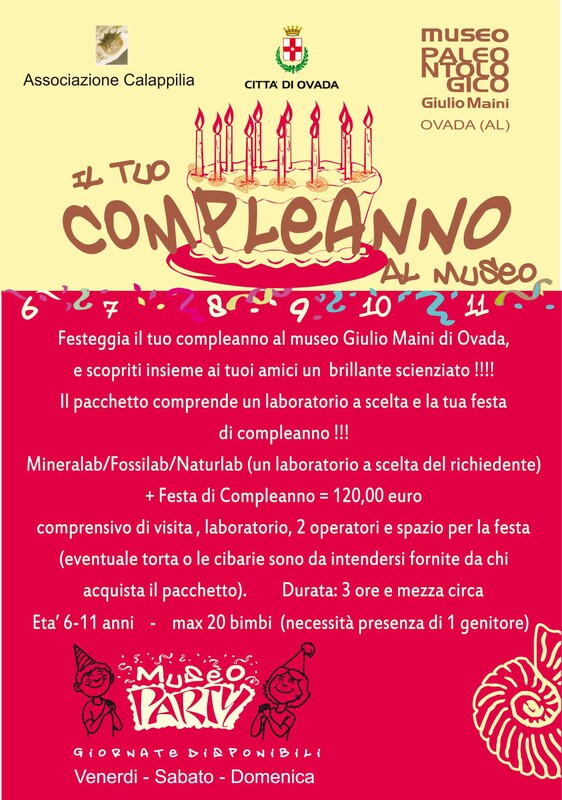 They will have the opportunity to learn about both big and small organisms of the past which lived in the ancient sea of the Monferrato area. It includes a playful workshop dealing with search, followed by a “fossil hunt” at the museum. Let’s start discovering the city parks, learning how to recognize the plants and animals that surround us. It includes a visit to the Pertini Park in Ovada and a playful workshop. Gifts to all young participants! You can access the dates of the next scheduled birthday parties by clicking on Events on the museum’s home page.